THE B-MOVIE NEWS VAULT: Lionsgate Resurrects Vestron Video with new Blu-ray Collector's Series in September! Lionsgate Resurrects Vestron Video with new Blu-ray Collector's Series in September! Lionsgate is one of the few major studios that is still keeping the Horror genre alive in theaters these days. And while I can't say I'm happy with everything they put out (I'm not), I will say that they've done us Horror fans a solid with some stellar DVD and Blu-ray releases for numerous cult titles. Because of Lionsgate, we have legit releases of long-lost faves like THE GATE, ALLIGATOR, and THE WRAITH. They've also done a stellar job on giving some major TLC to other genre classics like EVIL DEAD 2, THE MONSTER SQUAD, and MY BLOODY VALENTINE. And now it seems they are ready to up their game and step into the same arena as Scream/Shout! Factory, Synapse, Arrow Video, and other genre distribution labels with their announcement of the VESTRON VIDEO COLLECTOR'S SERIES! 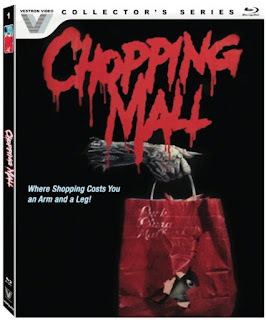 This new line of collectible limited edition Blu-rays is kicking off with CHOPPING MALL and BLOOD DINER with more titles promised (including RETURN OF THE LIVING DEAD 3, C.H.U.D. II: BUD THE CHUD, WAXWORK, and WAXWORK II: LOST IN TIME)! 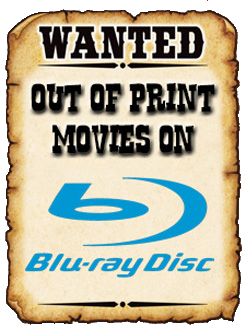 Read on for more details on these highly anticipated Blu-ray discs which debut on September 27th! ruined when the mall's three security robots go berserk and start murdering everyone! Audio Commentary with Director/Co-Writer Jim Wynorski, Actress Kelli Maroney, and Co-Writer/2nd Unit Director Steve Mitchell. Audio Commentary with Historians/Authors Nathaniel Thompson (Mondo Video) and Ryan Turek (Shock Till You Drop). Audio Commentary with Director/Co-Writer Jim Wynorski and Co-Writer/2nd Unit Director Steve Mitchell. Featurettes: Back to the Mall, Chopping Chopping Mall, The Killbots, Scoring Chopping Mall, The Robot Speaks, The Lost Scene, Army of One, Chopping Mall: Creating the Killbots. Isolated Score Track by Chuck Cirino! Film Synopsis: First they greet you, then they eat you! Two cannibalistic brothers murder young women to create new meals at their rundown restaurant. They also plan to awaken an ancient Egyptian goddess with their bloody sacrifices in this somewhat sequel to H.G. Lewis' BLOOD FEAST! The main course on this Blu-ray is the newly created HD master of BLOOD DINER that was supervised by Director Jackie Kong (THE BEING, NIGHT PATROL), and the film's Director of Photography! And to top it all off, there's a slew of new extras on this disc that should satiate the appetite of BLOOD DINER'S most ravenous fans! Audio Commentary with Director Jackie Kong! Featurettes: Queen Kong, The Cook, The Uncle, and The Detective, Open for Business, Scoring for Sheetar!, and You Are What They Eat. These flagship Blu-rays are due out on SEPTEMBER 27TH and will be available for a limited time. How limited? I have NO idea, but I'd say that you should probably snap these Vestron titles up as soon as they come out, just to be on the safe side! 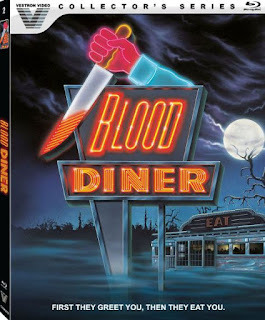 Order CHOPPING MALL and BLOOD DINER right now from Amazon.com, or get them both at DiabolikDVD.com (coming soon to their online catalog)! Stay tuned for more news and updates on other upcoming titles in Lionsgate's new distribution label!